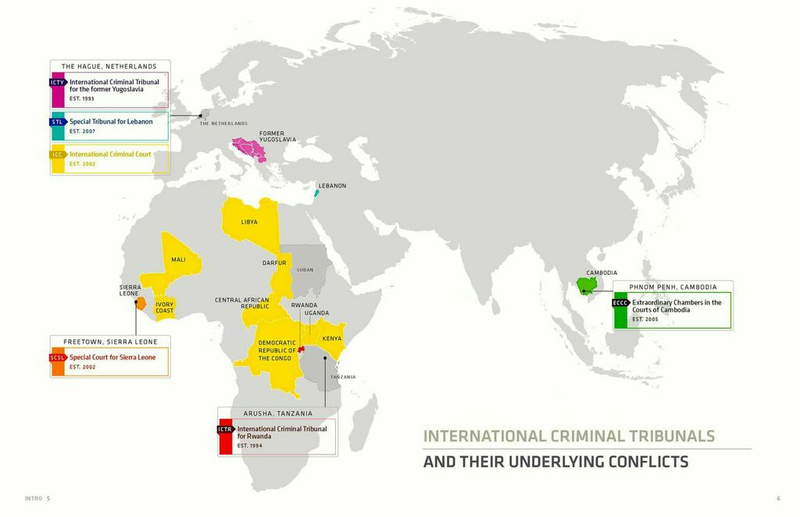 The Leitner Center launches a new report, “International Criminal Tribunals: A Visual Overview,” providing an introduction to the work of the international tribunals and the conflicts which led to their establishment. Despite widespread interest in these tribunals and the view that they represent a definitive advance of international law and justice, there is also much confusion and misconception about their work. This new 90-page report, providing analysis and information through written summaries and detailed visualizations, aims to make the work of the courts more accessible to the general public and legal professionals alike. The prosecution of high-ranking civilian and military leaders, including former heads of state, on charges of crimes against humanity, war crimes and genocide, represents the ultimate condemnation of their past actions, the underlying atrocities, and a measure of national and international justice. The new Leitner Center report provides information about each of the existing international tribunals: the International Criminal Tribunal for the Former Yugoslavia (ICTY), the International Criminal Tribunal for Rwanda (ICTR), the Special Court for Sierra Leone (SCSL), the Extraordinary Chambers in the Courts of Cambodia (ECCC), the Special Tribunal for Lebanon (STL), and the International Criminal Court (ICC). The report reviews the conflicts that led to the establishment of each court; their costs and funding; the crimes the courts are charging, the status of each case, and their conviction rates; sentencing; and reparations. Media attention dedicated to the work of the tribunals is too often superficial, and tends to confuse key distinctions between them; more informed scholarship, on the other hand, is largely confined to specialty publications, remaining inaccessible to most. “International Criminal Tribunals: A Visual Overview,” aims to provide well-researched and accessible information for anyone wishing to more fully understand these issues. This will help democratize engagement with these courts, which are tasked with delivering justice for victims of some of the world’s worst atrocities. Examples of the visual graphics in the report are included below. The report is available for download on our website here:http://www.leitnercenter.org/files/News/International Criminal Tribunals.pdf (and is best viewed as a downloaded PDF rather than through your web browser). For more information about this report, please contact Daniel McLaughlin, former Leitner Center Fellow and author of this report, at justicebydesign@gmail.com. For more information about Leitner Center programs, contact leitnercenter@law.fordham.edu.